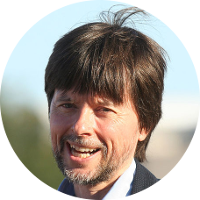 Ken Burns is an American director and producer of documentary films. His films have won numerous awards including two Emmys for his films Baseball (1994) and The National Parks: America's Best Idea (2009). His films have also been nominated for two Academy Awards. The paternal grandfather of Ken Burns is Dr. Robert Kyle Burns. Dr. Burns was an American biologist who was elected to the National Academy of Sciences in 1955. He did research at the University of Rochester and the Carnegie Institution of Washington. He also held an honorary professorship of zoology at Johns Hopkins University. But what he is truly remembered for is that he successfully turned male alligators into female alligators in 1937. It seems only fitting that Ken Burns should have both presidential and royal connections. Not only is he connected to the current royal family with kinship to Prince William through his mother Princess Diana, but he can also call two of the wives of King Henry VIII as cousins. Considering his recent documentary The Roosevelts: An Intimate Portrait (2014), it would have been interesting to have found a blood connection of the Roosevelts to Ken Burns. But not having found that, I did find the next best thing, a connection by marriage. William de Peyster, a 6th great-granduncle of Ken Burns is claimed to have married Margareta Roosevelt, a grand-daughter of Nicholas Roosevelt. Nicholas is an ancestor of Theodore, Franklin, and Eleanor Roosevelt. One thing Ken Burns does share with the Roosevelts is Dutch ancestors in colonial New York. The connection to the Roosevelts may still be there just waiting to be found. There is a claim on Wikipedia that Ken Burns is a descendant of the famous Scottish poet Robert Burns. One of Robert's most famous works is “Auld Lang Syne”. I have been able to research Ken Burns's male line ancestry up to Abraham and Margaret Burns, Ken Burns's 2nd great-grandparents. Abraham Burns was born in Virginia about 1833 and is a Civil War veteran. However I have not yet determined who Abraham's parents are and therefore have not been able to confirm his descendancy from Robert Burns the poet.